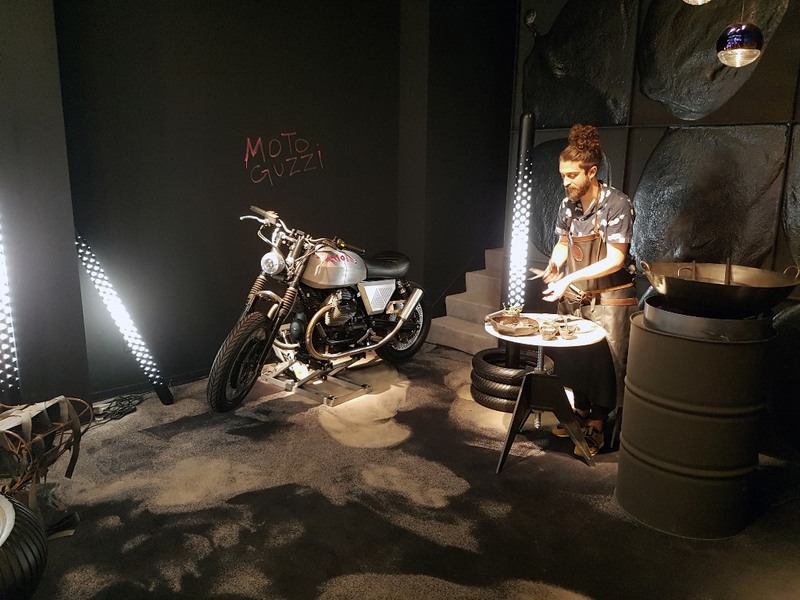 Patterned rims, bespoke Pirelli tyres, raw aluminium and a signature lamp for a headlight feature in Tom Dixon’s custom Moto Guzzi motorcycle, which was on show during Milan design week. 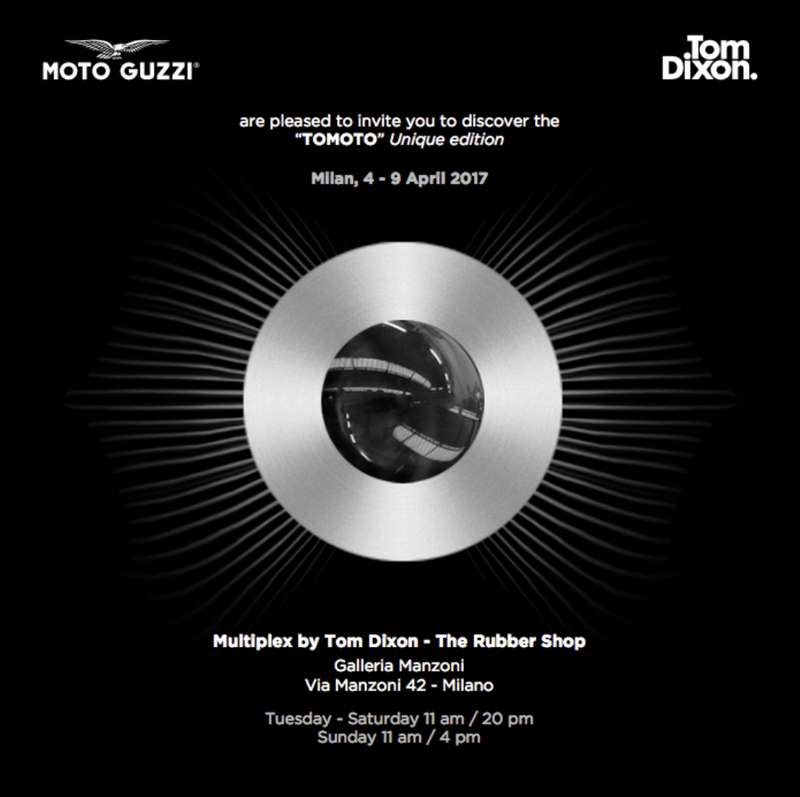 Tom Dixon and Moto Guzzi, historic eagle-branded company from Mandello del Lario, Como (IT), presented Tomoto motorcycle in the Rubber Shop at Dixon’s massive Multiplex exhibition in Milan – a showcase of new design by Dixon and several handpicked small studios, which took over the 1950s Teatro Manzoni cinema. 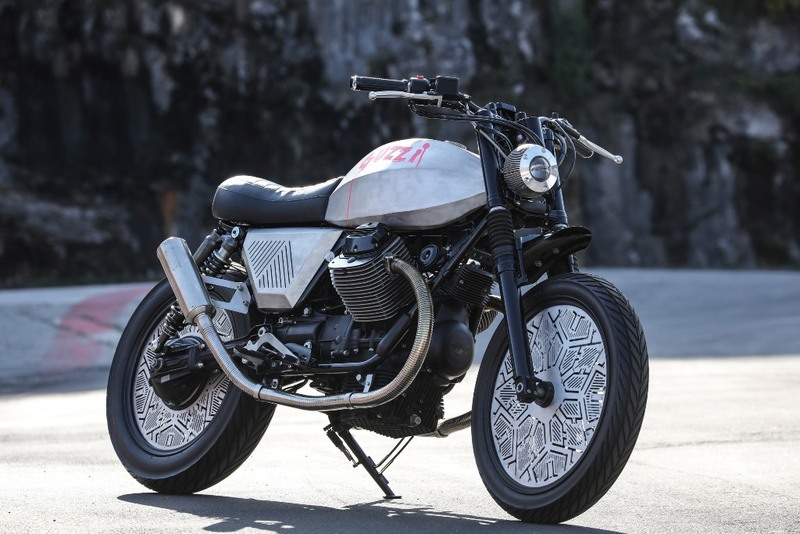 Dixon was inspired to embark on the collaboration following a lifelong passion for motorcycles, which he credits for starting his design career. 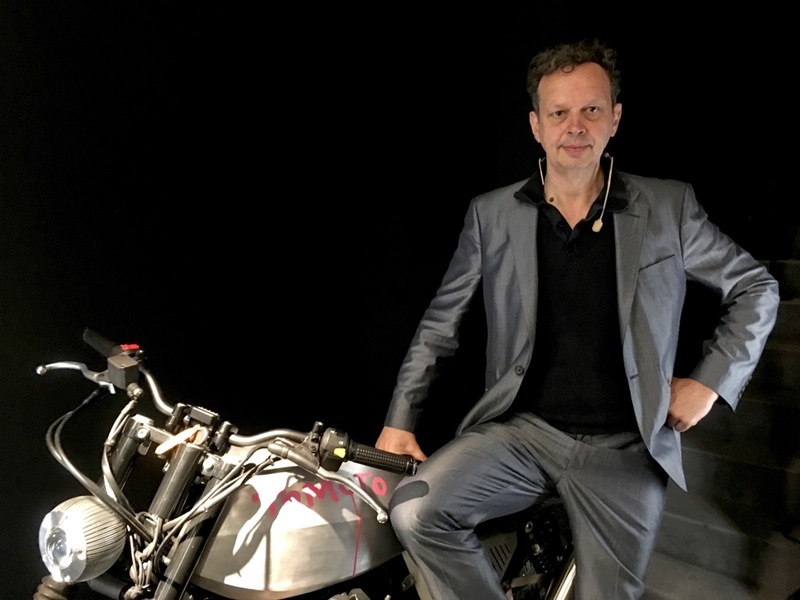 Tom Dixon presented the world premiere of Tomoto – Unique Edition: a custom, “one off” motorcycle that the British product designer, a faithful Guzzi fan, has planned for the 50thanniversary of the famous V7. 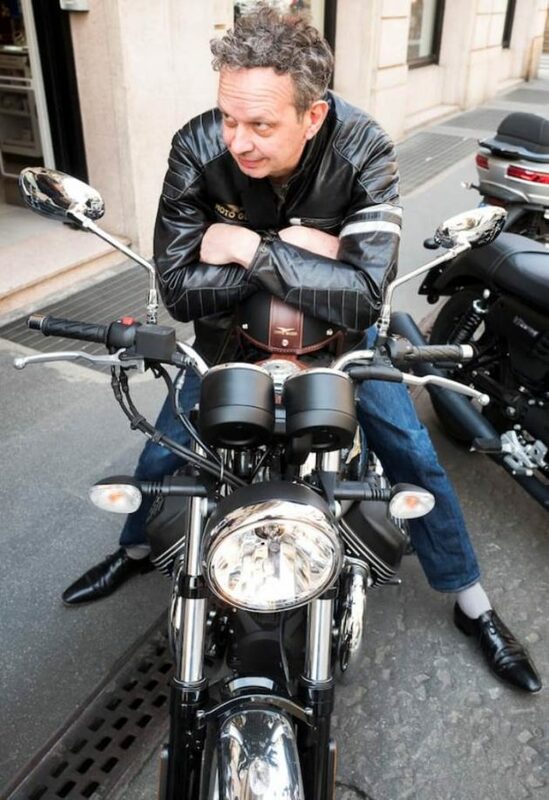 The resulting custom bike was created together with renowned customiser Stefano Venier. 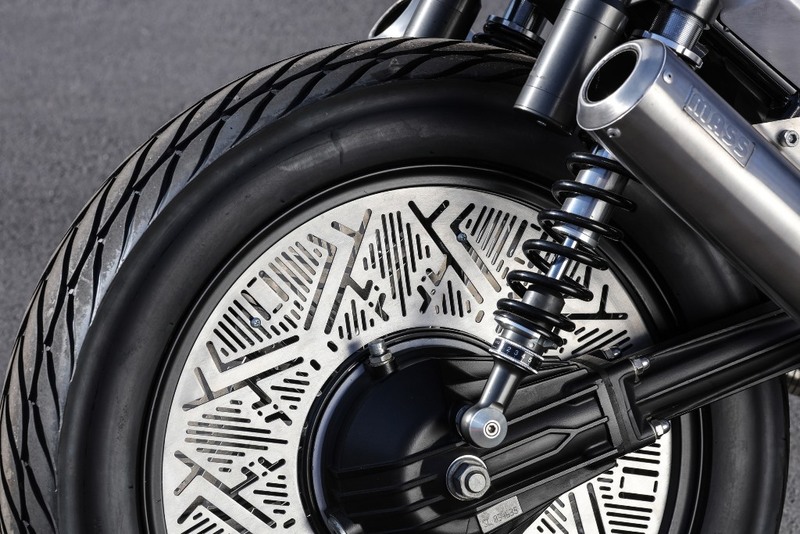 Among its features are aluminium wheel rims with a star-like geometric pattern created as part of Dixon’s experiments with digital punching technology. 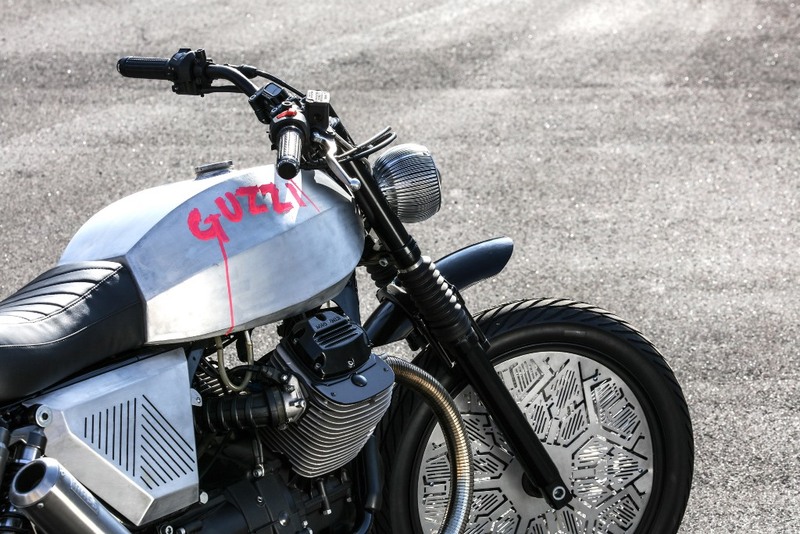 The same untreated aluminium is used for the gas tank, which bears the inscriptions “Guzzi” and “Tomoto” in dripping hot-pink paint. 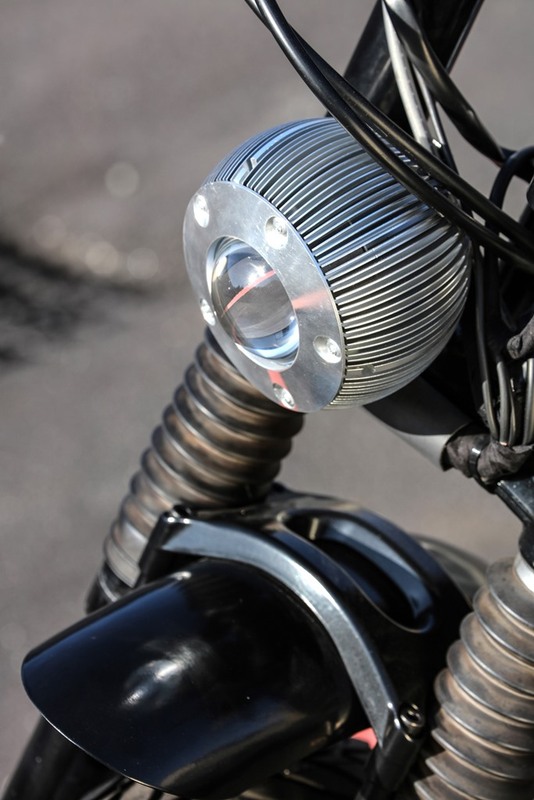 One of Dixon’s older pendant designs, the Fin, is re-purposed for the headlight, while a flexible exhaust pipe wraps around the motorcycle body from the engine. 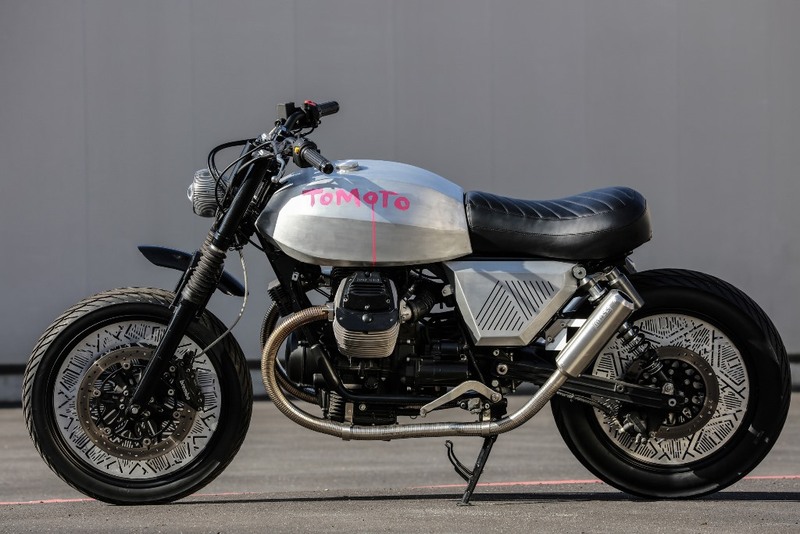 While the two collaborations might evolve into further projects in the future, the current iteration of Tomoto is a prototype and display model. 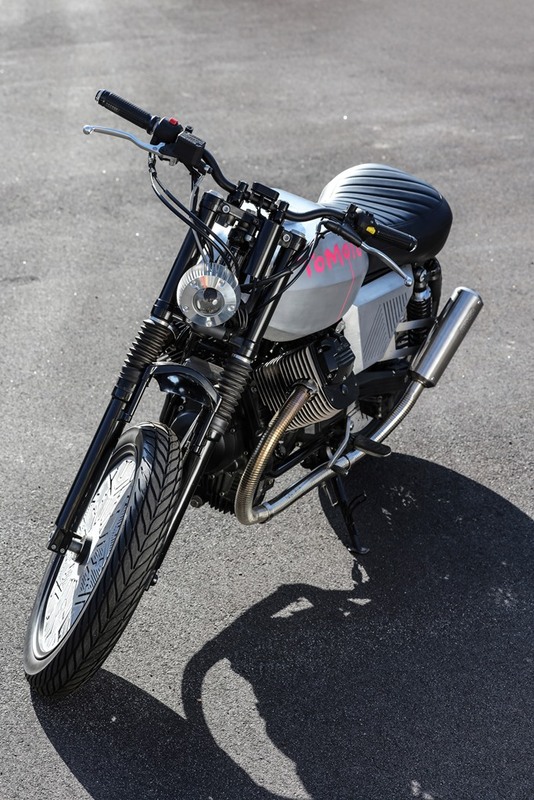 “The difficulty with doing a proper production motorcycle with Moto Guzzi is that every time you do anything more than basically changing the fairing or the seat, you have to put it through a whole new EU testing regime,” Dixon said. 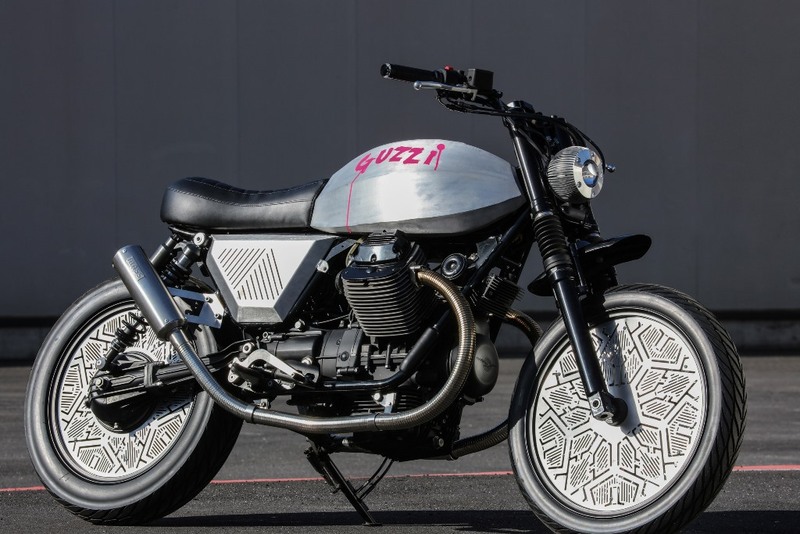 The bike is finished with new prototype tyres Dixon developed through a second collaboration, with Milan-based tyre manufacturer Pirelli. 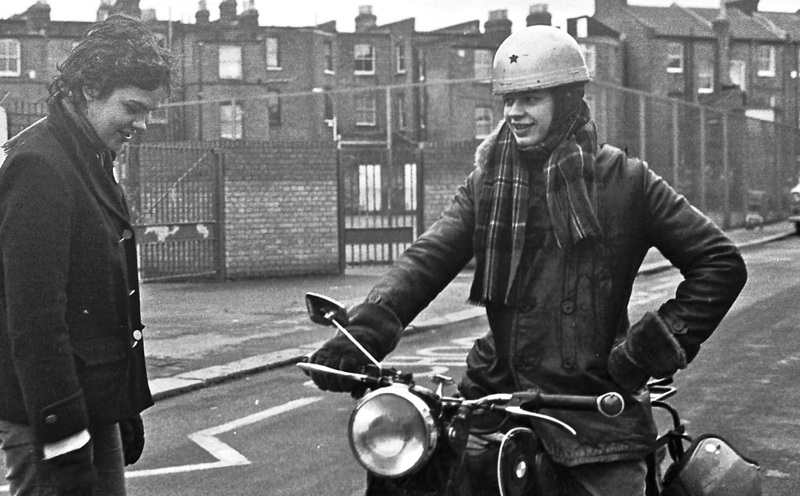 Dixon developed a number of tread patterns for the brand, which Dixon describes as “another fantasy firm, an Italian classic”. 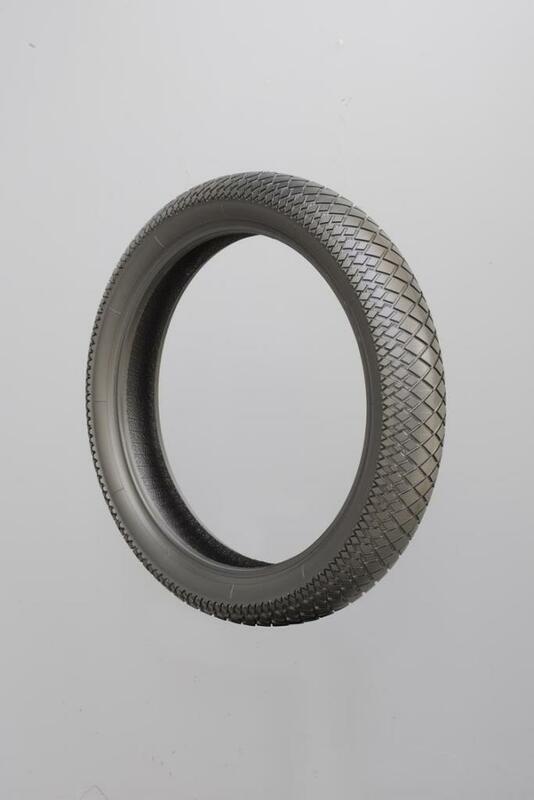 “Pirelli by Tom Dixon” is a limited and exclusive edition of three scooter tyres on which the artist has committed himself to realise innovative and original tread patterns. 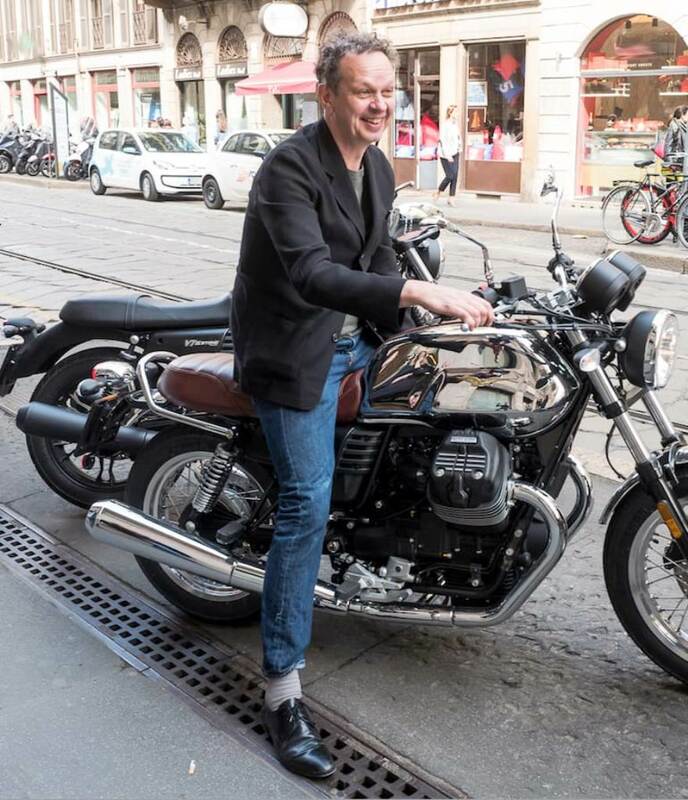 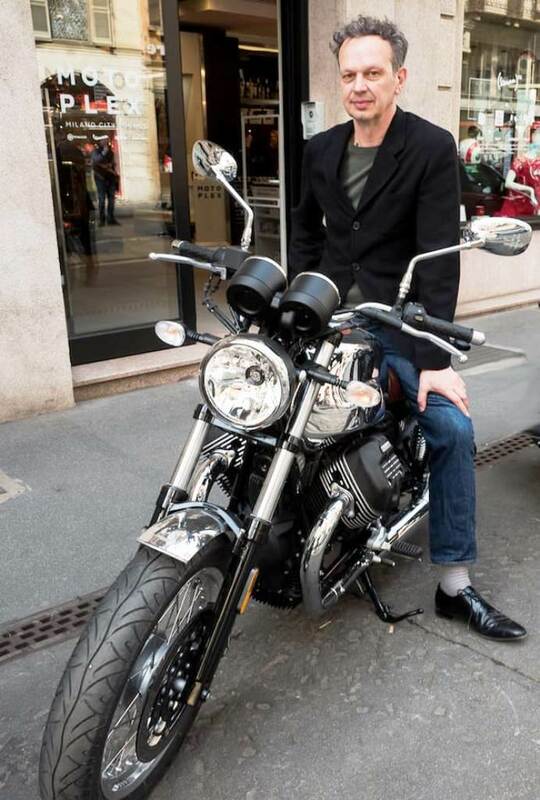 “I’ve always been interested in design, in motorcycles and in rubber as a material- so it’s a real pleasure to be working with Pirelli whose history in these fields is well known -and whose numerous collaborations with artists and designers are legendary.” says Tom Dixon. 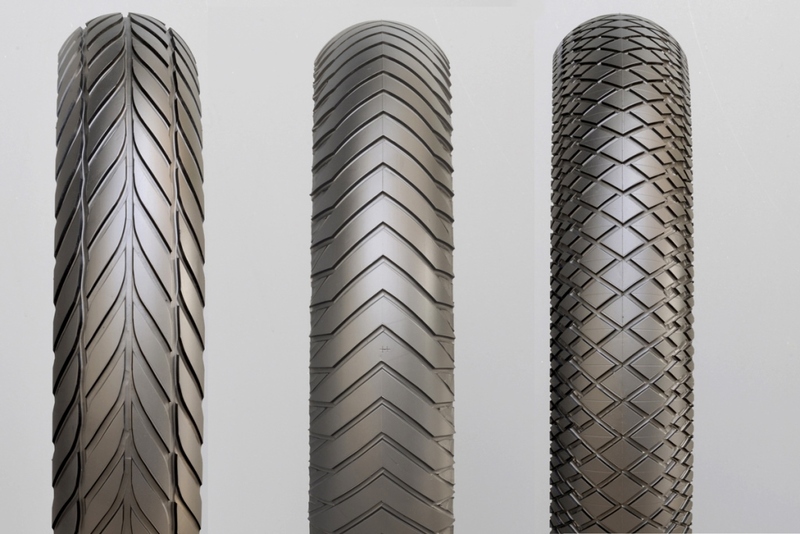 “It has been fascinating working with a company with such historical expertise to produce a series of new patterns within the complex series of technical parameters that exist in motorcycle tyre production”. 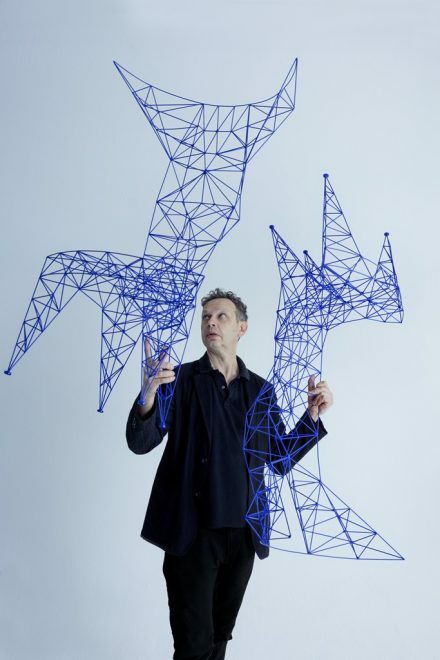 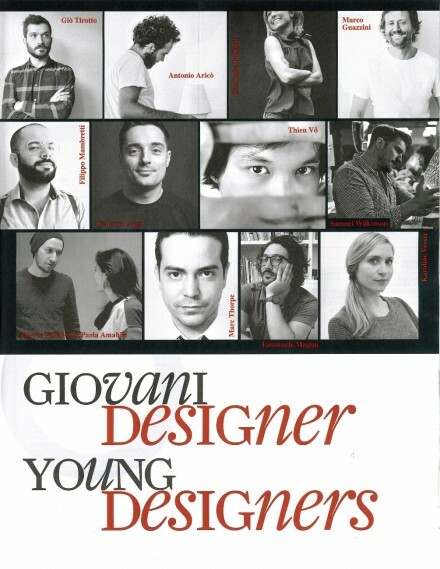 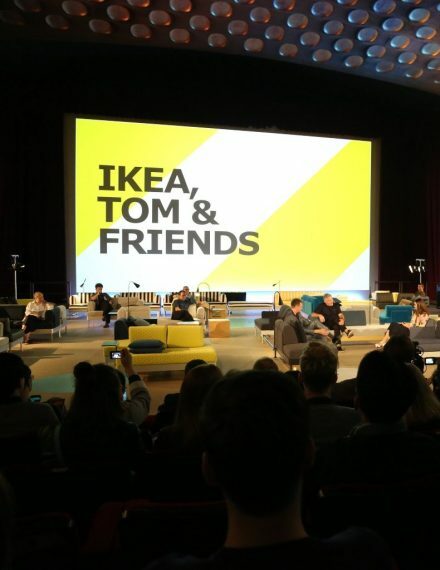 The collaboration between Pirelli and Tom Dixon was born almost by accident during a visit in the summer of last year of the British designer to Pirelli Headquarters in Milan. 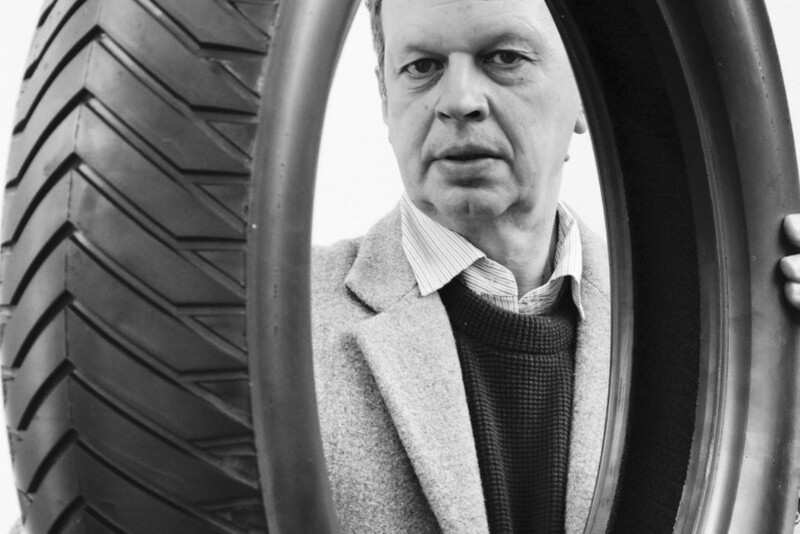 During the visit, the artist was impressed and fascinated by the work seen on the tyres expressing his willingness to cooperate in some way working with Pirelli onto tyre rubber. 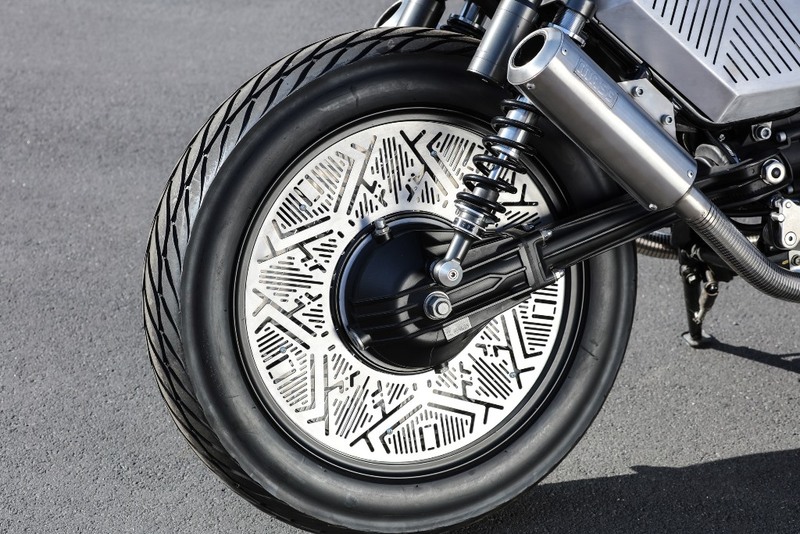 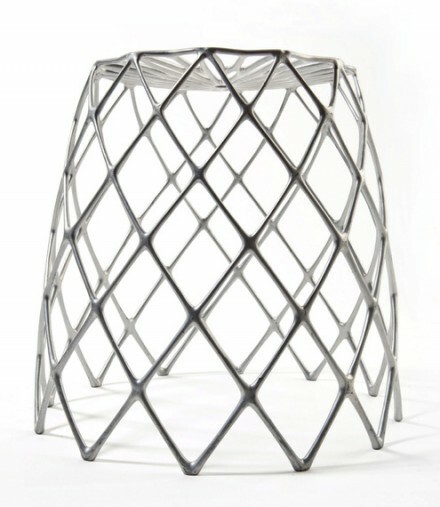 Considering the growing interest and attention from some motorcyclists regarding the tread pattern design of motorcycle and scooter tyres, Pirelli gave Tom Dixon ‘carte blanche’ and the opportunity to give vent to his creativity in the customisation of some scooter tyre tread pattern designs. 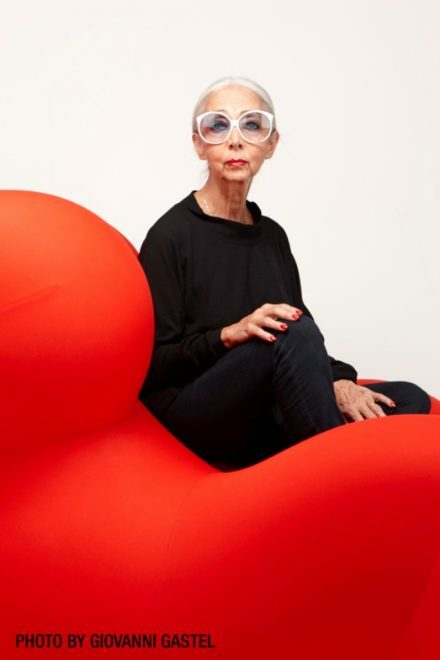 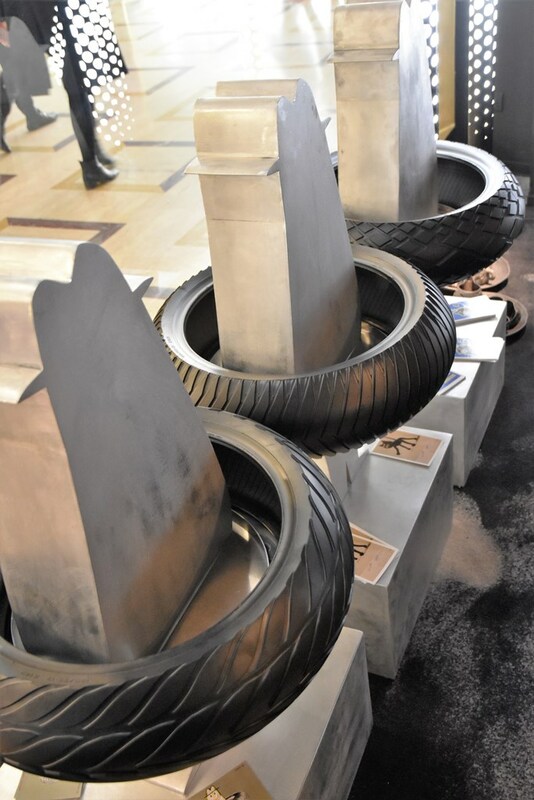 During Milan Design Week, the tyres were on display as well at the RubberyShop in Multiplex’ exhibition in Galleria Manzoni. 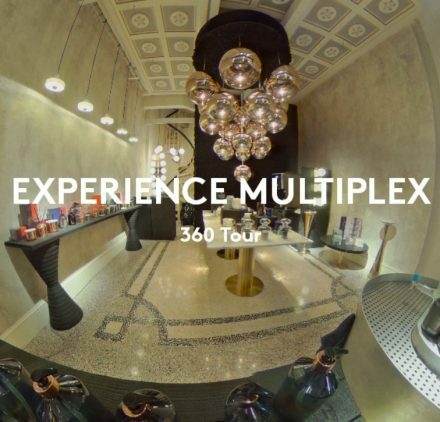 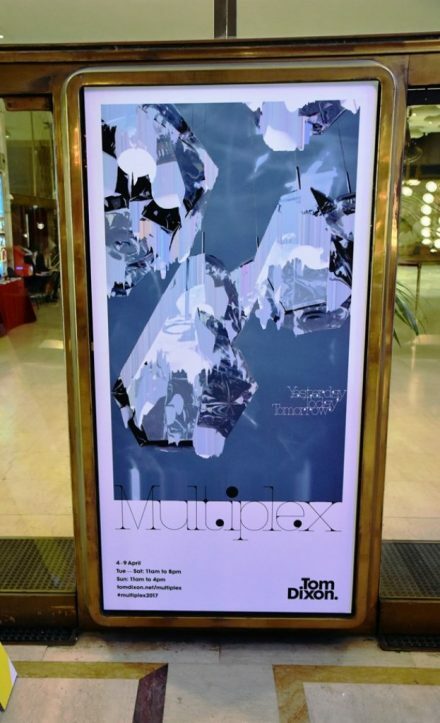 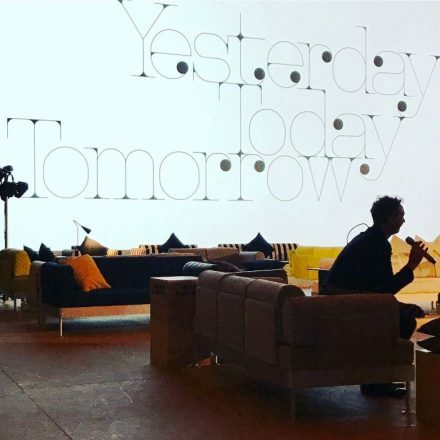 For the Salone del Mobile 2017, Tom Dixon brought Multiplex into the iconic Manzoni Cinema and Galleria in the very heart of Milan. 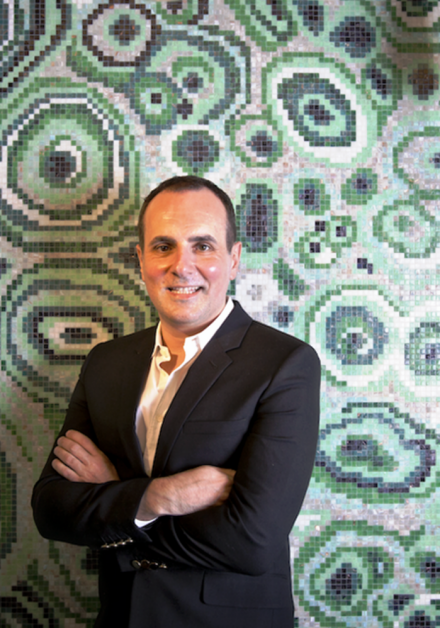 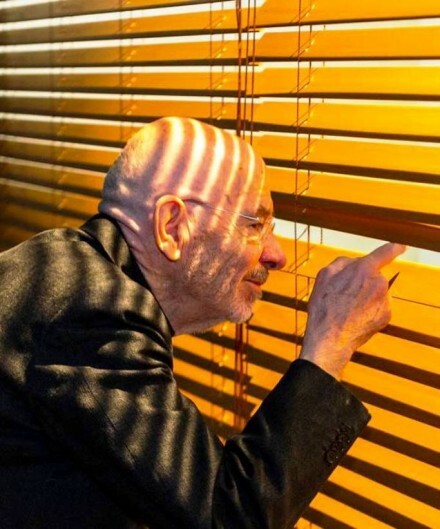 During Fuorisalone 2017, Bisazza launched 4 new patterns in glass mosaic tiles by Australian Interior Designer Greg Natale. 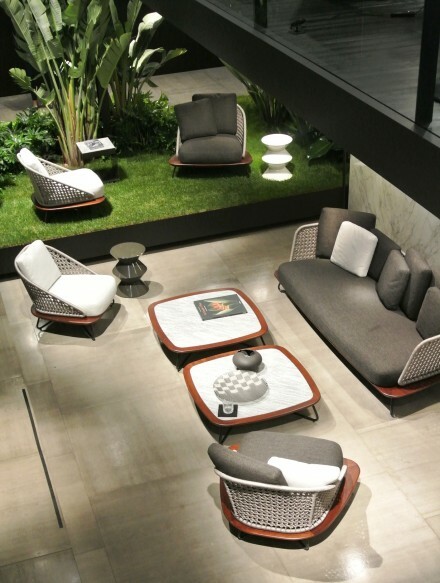 The “Composite Collection” designs explore organic motifs and celebrate the beauty to be found in irregularity.